I'm having a lot of fun with this one. She's an illusion/radiation controller, and the ability to make bad people fight each other is always good times for me. She also has a good solid roleplaying super group: she's a history professor turned mutant rights activist, after her lifelong very minor mutant powers ramped up sharply in the wake of being attacked by a Rikti artifact. So she's an adjunct instructor at a Paragon City school for young mutants while pursuing her own career of direct action. I figured I was reasonably well qualified to play someone with immune problems, and that they hit some classic comic book mutant vibes. It's possible that future storylines could lead to her being able to breathe the air and have it touch her skin again; if so, I'll work out what she looks like underneath. This is how it is: over the years I've had plenty of opportunities to watch friends play MMOs besides World of Warcraft and tried out a few myself, but I always ended up finding them too much of a drag for one reason or another. 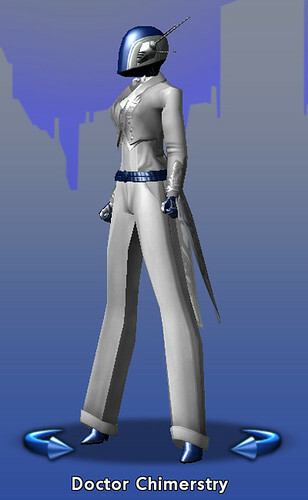 Back when it was new, several of my friends really got into City of Heroes, and I had fun watching, but at that point I didn't have a computer that could run it anyway. When City of Villains came out, I did, and I gave it a shot, and had some fun, but found it too grindy after a while. Too much the same old same old and such slow advancement. So I dropped it. Now there's a Mac client for it and I have a great new Mac, and friends who've always wanted me to try it with them, so...I signed up again. And y'know, I'm having a lot of fun. There are things I think it really does better than WoW, and some just plain differently, and I like the change of pace. (I will have a separate post on these thoughts.) I got to the end of my trial period and signed up for a regular account. My global handle there is @Penumbri and I'm playing on Virtue server, since that's where I have friends and also where there are some roleplaying opportunities. For me the game works in two modes: assembling as a team to vigorously beat up exotic targets more or less at random, and exploring alone or with a very few allies to actually follow storylines and learn how the world works and what's up. So I have some characters for each mode. I've also learned that while I love meleeing, I'm really too easily disoriented right now by rapid swings in viewpoint and prone to some sensory overload from too many powers' effects in close proximity and right up close on my screen. Fortunately, that still leaves me a lot of options. • Penumbri, magic defender, dark miasma/dark blast. Yes, my most advanced character is a magical type with shadow powers. This is presumably not a surprise. 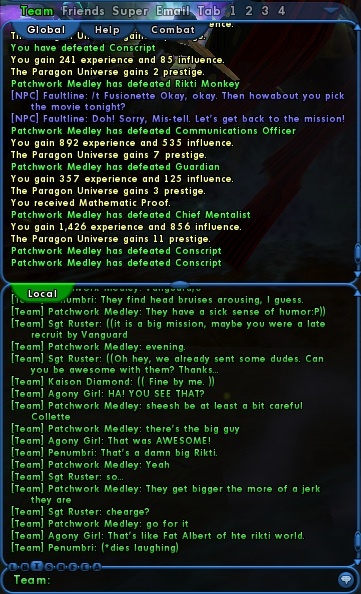 She's in her mid-20s and advancing well with a very congenial roleplaying group, the Incognitus faction of Paragon Universe. She's a former rationalist, which means in a superhero universe's context that she always figured all "magic" was psionics and misunderstanding. Then she committed suicide and ran into really inhuman entities in the abyss, who've been talking to her ever since, all through her recovery and building a new life. • Ada Phoenix, technological mastermind, robotics/traps. Yes, my next most advanced character is a robots-and-gadgets person. This is presumably also not a surprise. She's in her high 10s, hanging out some with a couple different villain groups, and being pure soloing delight most of the time. She's a likely candidate for turning neutral or even heroic when the Going Rogue expansion comes out, as crime is for her simply a more moral alternative than being a military-industrial cog. I've also got a rotating roster of experiments. Currently active: Accendi, a magic fire/fire blaster, and That Medulla Girl, a mutant illusion/radiation controller. More masterminds are probably next. And that's what I've been doing while on WoW hiatus. When I'm in position to pick up WoW again, I expect to continue this too.